Homestead Fence Company, offering split rail fencing for containment and rustic charm. 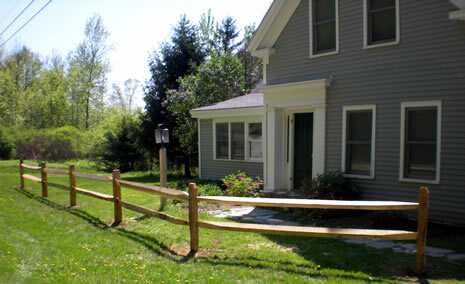 Split rail fences are decorative, extremely functional, and are often used in Vermont for their rustic look and charm. Split rail fencing is commonly used around the home and may be accompanied with a welded wire in black or green. Most often split rail fencing is used to keep children in the yard or to keep a pet contained. Spilt rail comes in two rails or three rails depending on personal preferences. There are some customers that prefer spilt rail fencing for equestrian fencing or livestock containment, although we might not recommend split rail for this purpose. We can put an offset on the inside of the fence to prevent an animal from rubbing on it to secure better the fence. The fence material that we often use for split rail fencing is a locust post with a hard wood rail of maple, ash, or oak. The fence is installed with pressure treated gates in a variety of widths. The gate posts are set in concrete to ensure stability and allow the gate to function correctly throughout the seasons of Vermont. W also e install cedar doweled split rail and pressure treated split rail.